Alberto Lievore is an Argentine architect and designer based in Barcelona. A consultant and art director on an international level (for companies like Arper), he has always made the materic-sensory dimension of objects and spaces one of the foundations of his ongoing holistic research. 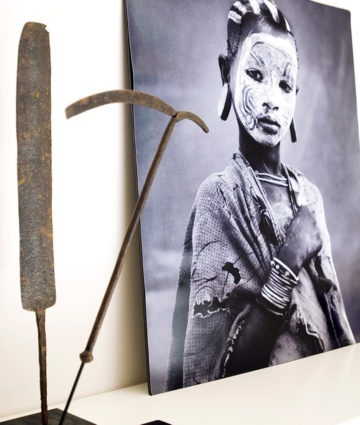 He works with native materials and essential forms, to update solid, timeless humanistic values, beyond encoded stylistic schemes and lexical dogma. 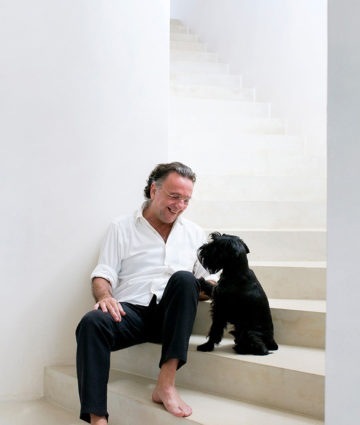 The residence he has designed for himself and his companion Lis Beltrán in Maiorca, Spain a few years ago is a case in point. 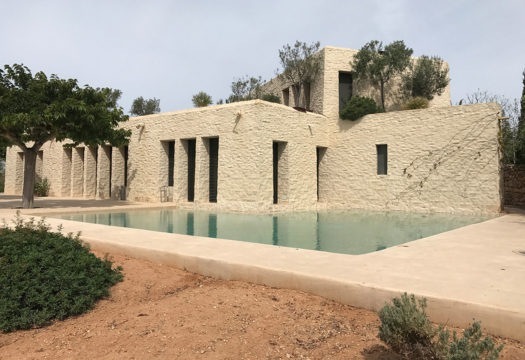 A vacation home on the largest of the Balearic Islands, conceived as a private refuge, a container of emotions and personal histories (“a mirror of the soul” as di Mario Praz famously put it). With a fresh image, always open to new possibilities of use of spaces and furnishings, the house adapts to changes in the weather and in life, making it always seem new. “Luxury in a vacation home means being able to make it exactly the way you want it, free of functional constraints,” the owner says. The character of the architecture, which conveys a sense of inimitable tranquility, comes above all from the material with which it is made: the typical local limestone. “It is a tribute to the buildings we see on our long walks down the southeast coast of the island, which remind us of old Mediterranean constructions scattered throughout southern Spain,” Lievore explains. The context has been an extraordinary influence. After searching for the right site for a long time, Lievore opted for an old rural house that has been incorporated in the new structure, in a dialectic relationship between old and modern, past and present, in full respect for nature and the landscape. 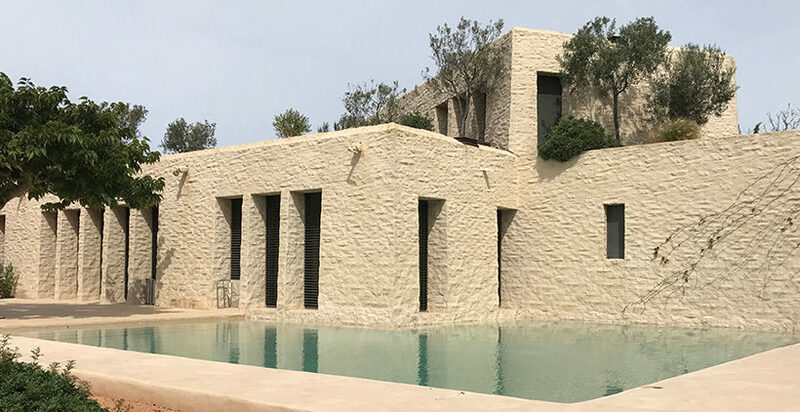 The building – 420 square meters on two levels – is organized in two parts: summer and winter, which from the height of the island face respectively towards the sea and a valley of pine trees. 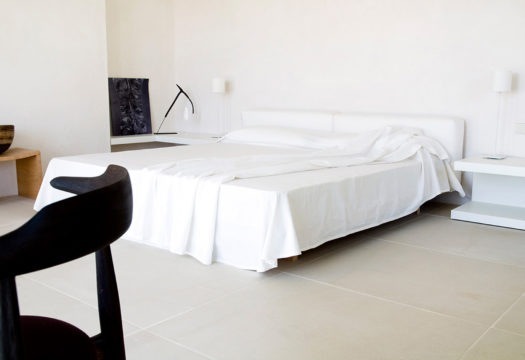 The upper volume, for the bedroom zone, fits diagonally into the lower one, set aside for the living areas organized around a hearth and communicating directly with the garden and the pool. 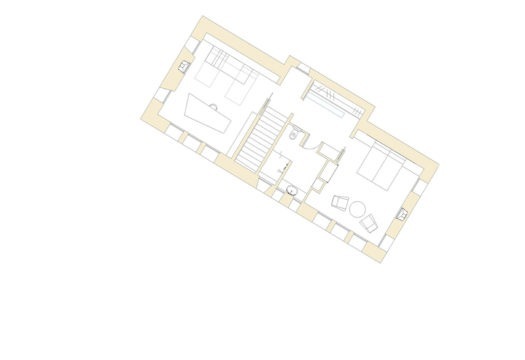 The two floors are connected by an internal white staircase with an essential linear form. 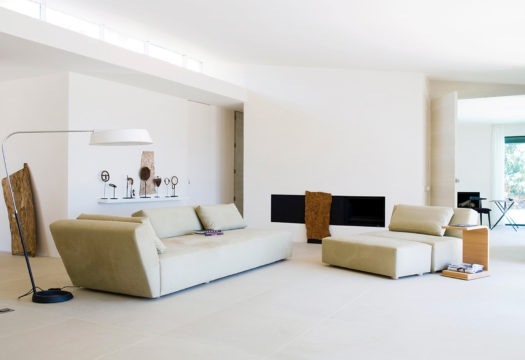 The compositional and geometric clarity of the whole house is underlined by the neutral setting of total white, open, flexible spaces, which encourage circulation and fluid perception of the rooms, accompanied by the uniform flooring in pale local stone, and the play of light and shadows. The ideal backdrop to bring out the lightness and elegance of the furnishings, featuring very expressive textures. Already in the entrance zone, one notes the contrast between the white, abstract spaces wrapped in diaphanous brightness, and the primitive art objects that form the mise en scène (photos Christian Schaulin, Kerstin Rose Medienservice). The dining area opens in two directions towards the surrounding nature. Around the Tulip table by Knoll, Catifa chairs by Arper. The refined twist of the spatial enclosure and the fluid relations between the spaces are underlined by the uniform flooring in Bateig stone. 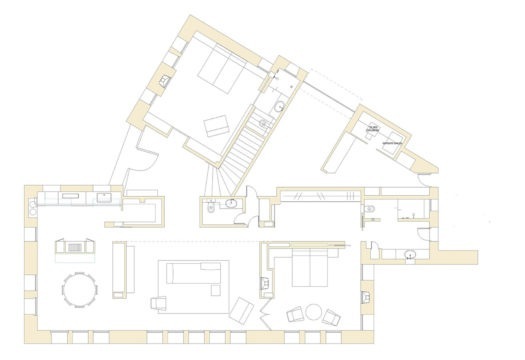 Plans of the two levels of the house. The large living area gravitates around the fireplace: there are six of them in the house (photos Christian Schaulin, Kerstin Rose Medienservice). The studio corner with Lievore’s worktable and the chairs by Arper (photos Christian Schaulin, Kerstin Rose Medienservice).